The motorcycle market will continue to grow this year albeit at a marginal rate, according to manufacturers. HCM CITY (VNS) - The motorcycle market will continue to grow this year albeit at a marginal rate, according to manufacturers. Speaking to Việt Nam News on the sidelines of a press conference last Friday to introduce the first Việt Nam Motorcycle Show to be held in HCM City in April, Yano Takeshi, general director of Yamaha Motor Việt Nam Company Ltd and chairman of the Việt Nam Association of Motorcycle Manufacturers, said, "This year may not see big growth." The growth would be 2-3 per cent, he said. 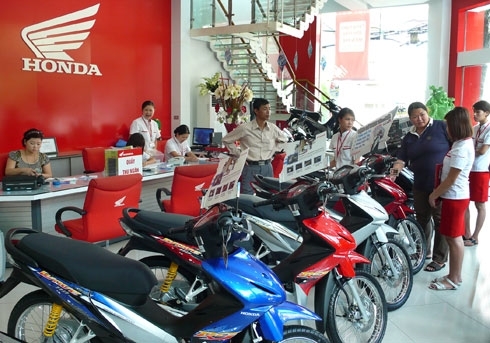 The biggest manufacturer with an over 70 per cent market share, Honda Việt Nam, too said growth would be sustained this year. Hồ Mạnh Tuấn, deputy director of Honda Việt Nam, said overall sales is expected to be around 2.85 million units this year. There is still demand from consumers in big cities like Hà Nội and HCM City, he told Việt Nam News. In addition to normal motorbikes for daily use, there is also demand for sports and specialised vehicles, and so the market would continue to grow, he added. In rural areas, demand is expected to be strong thanks to programmes to lay cement roads there. But Taiwanese-invested SYM has higher hopes for the market, saying growth will be around six per cent. A company spokesperson said the 2.8 million units expected to be sold does not reflect the potential of the market since sales could easily be 3-4 million. Insiders wants the Government to check the numbers of old motorbikes sold and ban the use of vehicles more than tens years old to ensure safety and also boost the industry. Last year, the market grew at four per cent as dozens of new models were introduced by importers and domestic manufacturers. Việt Nam is the forth biggest market in the world.